Generation Star Wars: Is binge-watching Stranger Things a good thing? In 2013 binge-watching was popularised by Netflix’s acclaimed House of Cards reboot. Andrew Lewin and I discussed the implications of watching a series in a matter of hours, not weeks. Rob Wainfur, the founder of The Bearded Trio, revisits the phenomenon in the wake of Stranger Things and Star Trek: Discovery. ‘Fake News’ has recently been named the word of the year by Collins Dictionary, but I really think the word should be ‘Binge-Watching!’ It seems to be not only the in-phrase at the moment but also the activity everyone is doing. Is that an indication that we are in the golden age of TV? Well, that may be a debate for another article, but I want to talk about the activity itself and explore why it’s become so popular. With TV on-demand being such a popular way to watch your favourite show these days, it’s no surprise that binge-watching has become a big thing. With a whole season or, in some cases, a whole series available to watch when you like and how you like, the temptation to sit down and continuously watch Star Trek: Deep Space Nine all the way through the Dominion War story arc, or finding out if Tim and Dawn will eventually get together in The Office, well the temptation is strong and the only dilemma is whether you devote the time to such a marathon? Also, if I don’t get that feeling of guilt when I feel I should turn my attention to something else such as another form of entertainment. Video games for instance. I love losing myself in games. The weird thing is I don’t tend to get that voice telling me to leave Skyrim alone after the third hour of playing. Is this because I feel like I’m achieving something? After all, even though I’m in a virtual world, I am completing quests, honing my alchemy skills or ridding the land of vampires. It’s all virtual, but my brain is satisfied with these activities. Watch TV for hours and the old grey matter starts to get twitchy. The problem is that a culture has developed recently that being first to see something, read something or play something makes you popular. Social media is starting to dictate how I watch TV! I am being forced to binge-watch because of that dreaded word, spoilers! Yes, I know I can leave social media alone, but I just can’t! I run a number of websites and Facebook, Twitter and other social platforms are a fundamental part of my work. Leave them alone and the sites suffer. Therefore, avoiding these platforms is near impossible for me. At the time of writing this, I haven’t started the second season of Stranger Things (yes, I’m the one). However, already I know the pace of the season, which episodes are good and where it dips and this was just from my Facebook timeline and an accidental dive down my Twitter feed. In fact, according to Netflix, Stranger Things season two has set a new record for being the most tweeted-about streaming show with a staggering 3.7 million tweets in just three days. With those kinds of numbers, you don’t stand a chance to avoid spoilers unless you binge-watch. Binge-watching is here to stay. On-demand television has seen to that. Yet, it seems binge-watching is not enough now thanks to the connected world we live in. ‘Binge-racing’ is now a thing. The term coined by Netflix refers to watching a new season of a show within 24-hours of its release, and the streaming service actually says more than 8.4 million members have binge-raced shows. This new trend is definitely not for me and for a few reasons. First, I like to savour the moment. I did binge-watch Stranger Things season one. Well, it was finished within three days. For me, that’s fast. But, after the final episode, I was disappointed. Not for the quality of the show, quite the opposite. I wanted more, to continue to be back in the eighties and enjoying the horror and innocence at the same time. I’m diabetic, so when I have a rare sugary treat such as a piece of chocolate or a biscuit I make sure I savour the moment. I’m tempted to stuff the whole lot in my mouth, but I know I will appreciate the sweet flavours and get a longer release of endorphins if I just take my time. Surely this is the same with a good TV show? Also, recent studies have shown that ‘binge-racing’ a show hampers your memories of the show and a second showing is needed to really enjoy the experience. 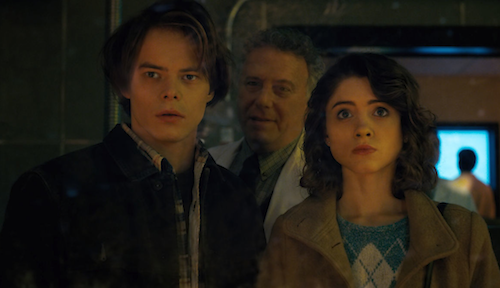 Three days of Stranger Things may not classify as ‘binge-racing’ per se, but the reason I haven’t watched season two yet is I’ve decided to watch the first season again and I have to say I am enjoying it, even more, the second time around with an episode a night. I’m picking up on little details I missed the first time around. I’m not condemning binge-watching! Everyone is different and so are viewing habits. But, it’s interesting to note how these habits are changing and whether we are being forced to follow to make sure we don’t get those dreaded spoilers. I even feel a little left out when I see my geek friends on Facebook are talking about the latest Daredevil episode and I can’t contribute. A small dilemma I admit, but still, it feels important for me as that is my community I like to mix with. I guess ‘binge-watching’ is not a new thing. I remember ‘binge-reading’ being a thing when a new Harry Potter book was released. Queues of Muggles would be lining up at midnight to get their hands on the book as soon as it was released. I remember a news report in the morning where they interviewed some fans who said they had camped outside the shop, not gone home and read the book through the night so they could be the first to have read it. Surely this has to be detrimental to the enjoyment of the story and I wonder if the same can be said when watching TV? Do you miss out on savouring each episode? Soaking in the atmosphere or the biggest one for me, the anticipation. Star Trek: Discovery is currently streaming on Netflix outside the US and is being released the old fashioned way, one episode a week. For me, I am so happy and relieved that this is the format they decided to go with. Instead of having a timeline discussing how the whole series went, now we are getting discussions on each episode and for me, it makes the universe you intend to be part of for an hour all that much richer. I love on-demand TV. I could never go back to the way it was. The temptation is there to binge-watch and from time to time I will. Car Share season two was on BBC iPlayer right from the start and being only six half-hour episodes, I watched the whole season in one sitting. I loved it but felt disappointed afterwards that it was over. I could have let that enjoyment last over six weeks but like the kid inside me with a big bar of chocolate, I ate the lot. I should have felt happy, but instead, I felt disappointed. I wanted more. With entertainment becoming more on-demand should we be more disciplined? Is on-demand actually reducing our enjoyment of TV? With the world connected and seemingly wanting to share their opinions with the rest of us are we being forced down a road where getting a quick bang for our buck is the new way of watching TV? How do you feel about binge-watching? Do you think it hampers your enjoyment of a series or actually enhances it? Do you prefer Netflix releasing an episode a week or all at once? Let me know in the comments below. Rob is the founder of The Bearded Trio website. A site dedicated to the works of Steven Spielberg, George Lucas and John Williams. He has no issues binge-listening to John Williams.